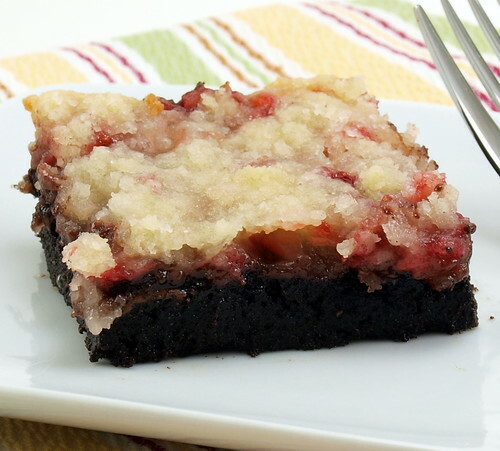 I do not often discuss the struggles I go through testing and re-testing recipes because I am not sure how interesting my development process is to you all. 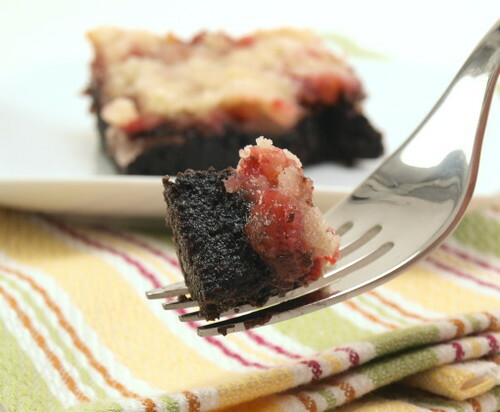 Some recipes come together with one try, but those are sadly few and far between. Others, like this recipe, make me want to tear out my hair, weep, cry, and eventually give up blogging and move to Phi Phi Island. However, the struggle was worth it in the end because what I came up with is well worth the effort. I struggled with the crust. I tried some variations on a chocolate short crust pastry that either overcooked and became dry, or was too moist and flavorless. I opted instead for chocolate wafer cookies. They have the right texture, crisp and crumbly, and they have plenty of flavor. 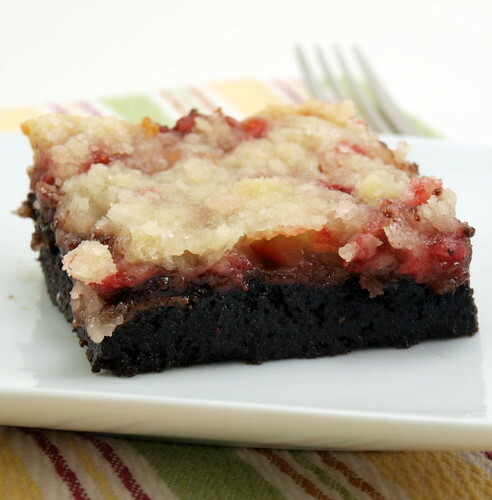 Combine that crust with the sweet berries, creamy Nutella, and the buttery topping and you have an over-the-top bar experience. Heat the oven to 350 F. Spray a 8×8″ pan with non-stick spray, line with parchment paper leaving a three inch over hang on each side, and spray that with non-stick spray. 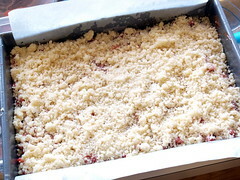 In a large bowl combine the cookie crumbs, sugar and butter and stir until all the crumbs are coated with the butter. 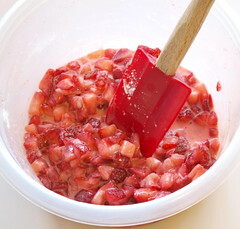 Pour the mixture into the prepared pan and press it out evenly. Bake for 10 minutes. While the crust bakes prepare the filling and the topping. 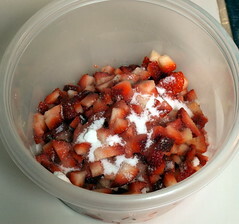 For the filling combine the strawberries with the sugar and allow to stand for ten minutes. Drain off half of the liquid, then add the cornstarch and vanilla. Stir to combine. 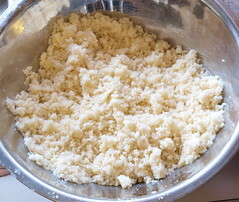 For the topping combine the sugar, salt, and flour until evenly mixed. 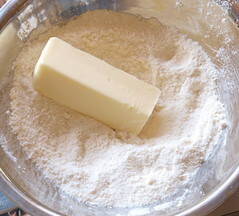 Rub the butter in with your fingers until the mixture is coarse and crumbly and no large pieces of butter remain. 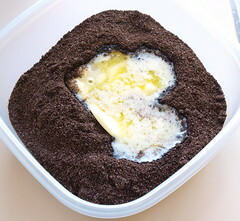 Refrigerate for ten minutes. Heat the Nutella in the microwave for ten seconds, or until it thins out slightly. 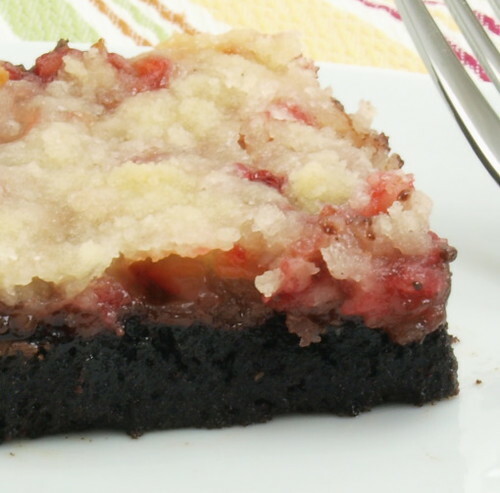 Pour the Nutella over the prepared crust and carefully spread it to the edges of the crust. 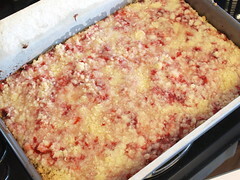 Evenly distribute the strawberries, then the crumb topping. 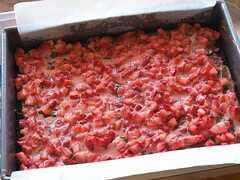 Bake for 30 to 35 minutes, or until the topping is crisp and the berries are bubbling all over. 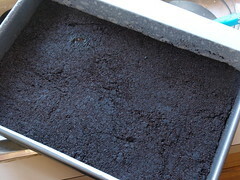 Allow to cool completely in the pan before using the parchment to carefully lift the bars out of the pan. Cut into bars.